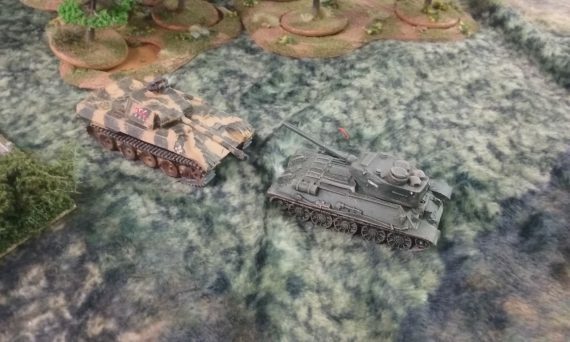 One of the games I was excited to see at Midwest Miniatures Expo was What a Tanker!, a game of WWII tank combat made by Too Fat Lardies. Each player runs one or up to a handful of tanks. Each tank has a two statistics- Armor and Strike. Those are the defensive and offensive abilities of the tank. Most tank have one or two special abilities called Features. To start each turn, one die is rolled for each tank to establish initiative order. For its individual turn, each tank rolls six dice and those results determine what your tank is able to do this turn. Briefly, 1=move, 2= acquire a target, 3=aim, 4=shoot, 5=reload, and 6=wild or other special actions. Ideally, you will get a good mix of die results and be able to find a target, shoot it and reload, ready for next turn. The special abilities also come into play here. My tanks were fast, which meant I could convert any single die to a one for extra movement. This Game saw me running two Soviet t32/85 tanks versus another player's two German Panthers. 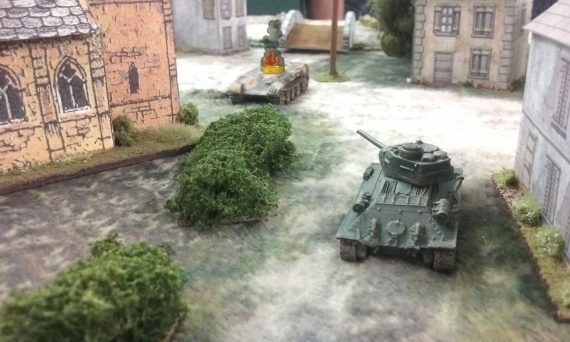 In the first turn, my left tank got a lucky shot and destroyed one of the panthers. More frequently, a shot would cause temporary or permanent loss of command dice, reducing the options for future turns. On the right side of the board, our tanks were not able to get off a successful shot. 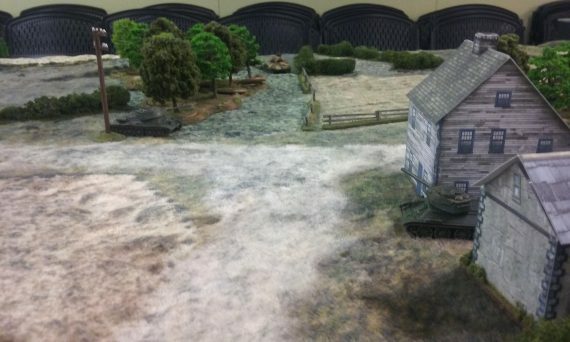 This might be a good time to mention that we were using 15mm tanks that were originally painted with other games in mind. The terrain is mostly paper buildings, which look quite good at this scale, especially with some added lichen and flock. I took both of my tanks in, trying to surround the remaining panther. This looked to be going ok for a while, but eventually my tank hiding behind that house was destroyed. My remaining tank pursued around some woods and eventually found itself with its back to the panther's front. This did not end well for me and my final tank was destroyed. I very much enjoyed What a Tanker! and I have picked up the rules in PDF. It might be fun to use with some of our Konflikt 47 tanks some time. I have also seen a facebook group dedicated to playing this game with 1/144 Gundams. Too Fat Lardies also appear to be working on a set of fantasy rules- a significant departure from their norm- so I will look forward to seeing those. Ah, yes, I forgot to add the pic and description of this game, which is good since you actually played it and could do it more justice! Seems like a very simple ruleset, albeit maybe a bit high on randomness. How does damage on the tank work? Area/systems damage, or just a health bar type deal? It does have you roll to see what you can do with your turn, so yeah you usually don’t like that. It is very rare to get no usable results, so the roll is less all or nothing than Dragon Rampant. Damage comes in a few varieties. The attacker and defender roll dice equal to their shoot and armor respectively. In this game they were all 7 or 8, which is about the middle of the range. Anyway, the shooter is looking for normal and critical hits. For shooting the front armor this 5 for normal and 6 for critical. Rear armor is 3 and 4-6. The defender is always looking for 5 or 6. Each defender success cancels a hit. On 3 hits the defender is destroyed. 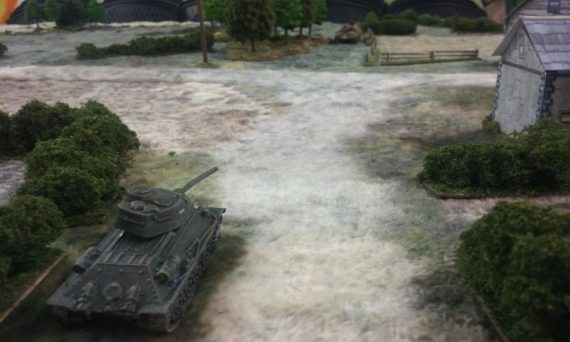 On 1 or 2, the defender looses command dice, so the tank just has fewer actions. If ithe hit was more regular hits than critical, the damage can be healed with a 6 activation die.